CASiLaC Memory, Commemoration and Uses of the Past cluster workshop will take place at the Glucksman next Friday afternoon. 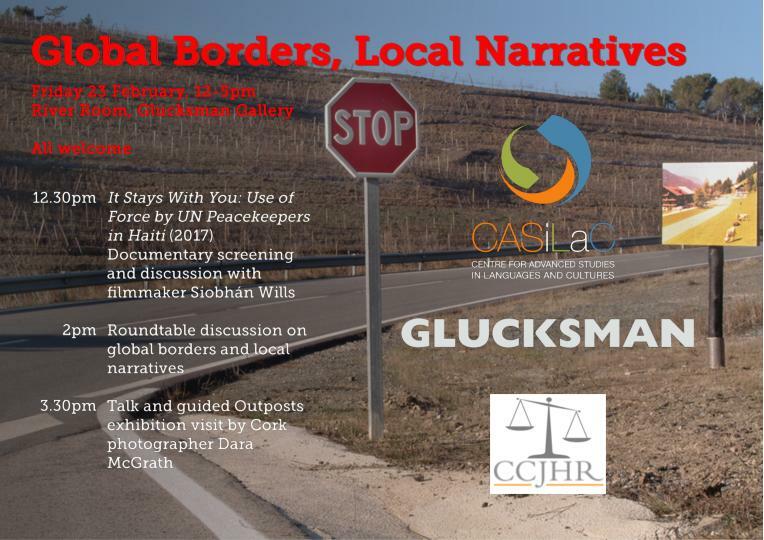 The workshop includes a documentary film screening and discussion in partnership with UCC’s Centre for Criminal Justice and Human Rights, and a tour of the current exhibition ‘Global Borders and National Boundaries’ with exhibited artist Dara McGrath. Please do come along – all are welcome. This event is funded and facilitated by the Centre for Advanced Studies in Languages and Cultures (CASiLaC), the Centre for Criminal Justice and Human Rights (CCJHR) and the Glucksman Gallery.